We will meet each Monday from January 28th through March 25th to take into account two Monday holidays. This will be an interactive writing lab featuring the Thinking Maps. I will have the ELA prompts available for all students and those not currently enrolled in English will select from the list. All ELD and 11th grade students would benefit from individual writing instruction! 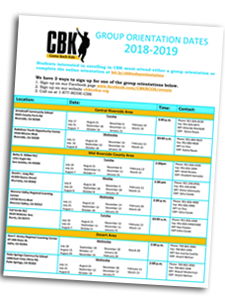 DOWNLOAD our current 2018-2019 Orientation Schedule. Including links to Facebook orientation registration, and online orientation option. Meeting is from 10am-1pm. Students pick up and drop off times will vary by site. Make sure you check with your CDP for pick up details if you need a ride. Thank you for contacting CBK, we will respond to your question soon.